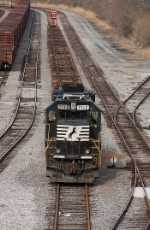 Description: NS Westbound Intermodal Train rumbles through Woodlawn, Al. Description: WOW! I can't believe I got this lucky to catch NS pulling a passanger train through Bath SC. I believe I framed that shot just right to my only problem was the sun was against me. Description: NS 24T crosses Hilltop Road. Description: A quadruple-GP60 powered 214 crosses over from Manville to Bridgewater on the Raritan River Bridge. Description: A trio of GP60s pull todays 214 as the sun rises. 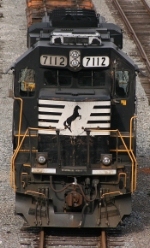 Description: Norfolk Southern Eastbound Intermodal Train 214 Passes Manville, NJ. Description: NS intermodal 213 swings west by the CP Laurel signal across Tuckerton Rd lead by a GP60 showing some signs of needing a sprucing up. Description: Couldn't get to the end of the platform in time. Description: 350's engineer notches up his quartet of GP60's as the train pulls out of the yard. Description: A quartet of GP60s lead 350 away from Linwood Yard at Lee. Description: A trio of GP60s throttle up as they lead 350 out of Linwood at Lee. Description: NS P61 races across the Third Creek trestle on a goregous late October afternoon. Description: NS PH02, the local for Oyama yard in Hickory, does its duty on a warm October day. Title: NS 7112 leads 6 other units westbound at D&S Jct. Description: NS 922 tied down in the yard.